For Week Four of our 2016 Cocktail Showdown, we visited two of the higher volume bars in town. With expectations of large servings of strong concoctions, we sat down with Alison and Dylan at Dempsey’s Public House before ending our evening with Steph and Heather at The Empire Tavern. Whether in the order we chose, in reverse order, or with stops before or in between, these two establishments are staples of the Downtown Fargo scene and while neither place features hand made ingredients or funky infusions, they both cater perfectly to their packed crowds by serving up sizable portions at reasonable prices and I’ve never heard anyone in town refer to their drinks as weak. With a newly remodeled room that pulls the free live entertainment away from the restroom area and into its own space, Dempsey’s also boasts a revamped pizza menu with artisan pizzas made from fresh ingredients and hand-tossed crust. Still at 226 North Broadway with the same friendly, accepting staff and environment, it offers an Irish pub feel in the heart of downtown Fargo. Daily food and drink specials are a favorite feature and the gaming space was also moved and expanded with the latest remodel. Thursday nights feature an award-winning open mic night hosted by Nathan Pitcher of Boots, who also books a diverse but talented mix of local and regional acts which perform no cover shows on the weekends. 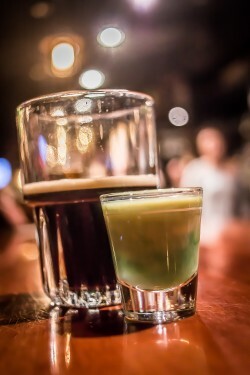 A simple twist on the classic Irish Car Bomb shot, Alison adds Dr. McGillicuddy’s Vanilla and green creme de menthe to a shot glass half full of Bailey’s Irish Creme and sets it next to a half glass of Guinness beer. The green creme de menthe swirls around with the creamy beige Bailey’s to create the “trippy effect” while adding a dose of menthol mint and vanilla sweetness to what would otherwise be a standard Irish Car Bomb. The ritual of the Car Bomb, for those who are unaware, is to drop the shot glass into a half glass of Guinness and then shoot it before the Bailey’s starts to curdle in the glass. Car Bombs at Dempsey’s is a ritual I used to participate in every time an old friend, Sloth, would visit from out of town. Without a doubt, we will be asking for a Trippy Mint should we meet up during his next visit. Dylan created this drink as a tribute to Cameron Critt who was a part time helper at Dempsey’s and full time friend to the entire staff. Cameron’s untimely passing was hard on the staff and Dylan felt a drink was needed to soothe the pain and bring about many future opportunities to remember a friend of the family at Dempsey’s. He starts with 2 cranberries in the bottom of a rocks glass that he then fills with ice. In an ice-filled shaker he adds Jameson Black Barrel, Disaronno, and apple juice before shaking and straining into the rocks glass. A squirt of ginger ale from the gun gets added before thin slices of apple; and a cinnamon stick is placed in the glass as a stir stick and garnish. 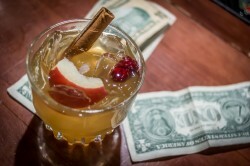 Perfect for fall, this drinks almost like a whiskey cider and the juice and amaretto sweetness tame the bite of the whiskey hidden within. Sip with caution because there’s plenty of alcohol in this sweet cider and it will probably sneak up on you before you finish the drink. 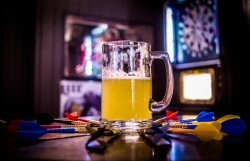 A couple blocks north, at 424 Broadway, The Empire Tavern is quite well known as the best bang for your buck. Notorious for serving up some of the largest “shots” in town (seriously, they usually come in a mug? ), The “E” has recently expanded their tap beer selection to include more of the craft beers consumers are craving. They also have daily happy hour drink specials, Pizza Corner pizzas, and an attached off-sale that sees quite a bit of action near closing time. This shot at this bar is responsible for a significant portion of the entire metro area’s Revelstoke Pineapple sales. Starting with the relatively new pineapple-flavored whiskey, Steph adds Apple Pucker, pineapple juice and the Rocky Mountain High Hemp Lemonade, a name which nods to the infamous strain of marijuana. Served in a frosty mug, this shot is a hit of pineapple with light hints of the sour apple blended into the sweet and tart lemonade. I was especially surprised by how light and clean this fruity shot finished. Jeremy’s recipe is a departure from the classic Manhattan, that calls for a sour mash whiskey, Dickel no. 12, Angostura bitters, cherry juice, sweet vermouth and a squeeze of both lemon and lime juice. 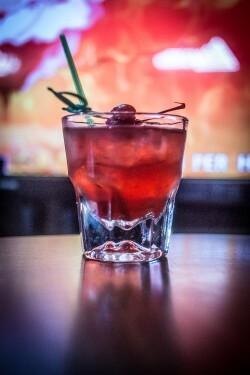 After the ingredients are shaken and strained into a rocks glass, a maraschino cherry on a sword pick is placed on top as garnish. Much smoother than a standard Manhattan, the sweet sugary cherry juice and citrus make the whiskey all but disappear into a sugary, syrupy finish. A whiskey cocktail for those who want the effect but don’t want to taste the whiskey.